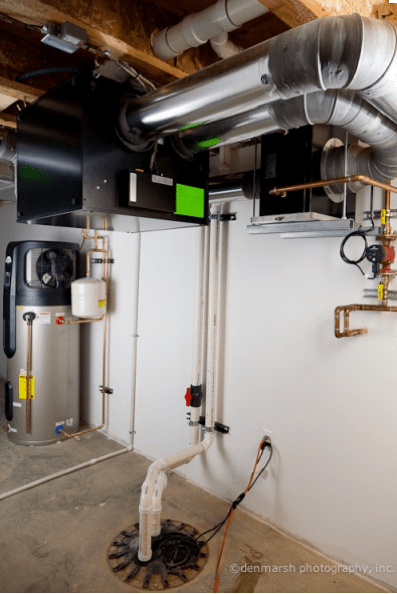 LEED recommends an HRV or ERV mechanical ventilation and air purification system to provide adequate ventilation and air quality in a super tight structure. AE Building Systems also carries one of the most energy efficient Energy Recovery Ventilators (ERV). The ERV tempers the incoming ventilated air by crossing it with the outgoing home air. Heat Recovery Ventilators (HRV) work about the same way, except they don’t transfer humidity from the exchanged air. The RecouperAerator, made by Ultimate Air in Ohio is both an air filtration system with a high MERV rating and a ventilation system that tempers the incoming fresh air and exhausts stale air from the home. The recommended ducting for the system delivers fresh air at ceiling level and returns at floor level. The unit can also be incorporated into a furnace system. The unit needs to be sized to deliver the right amount of ventilation for the space. 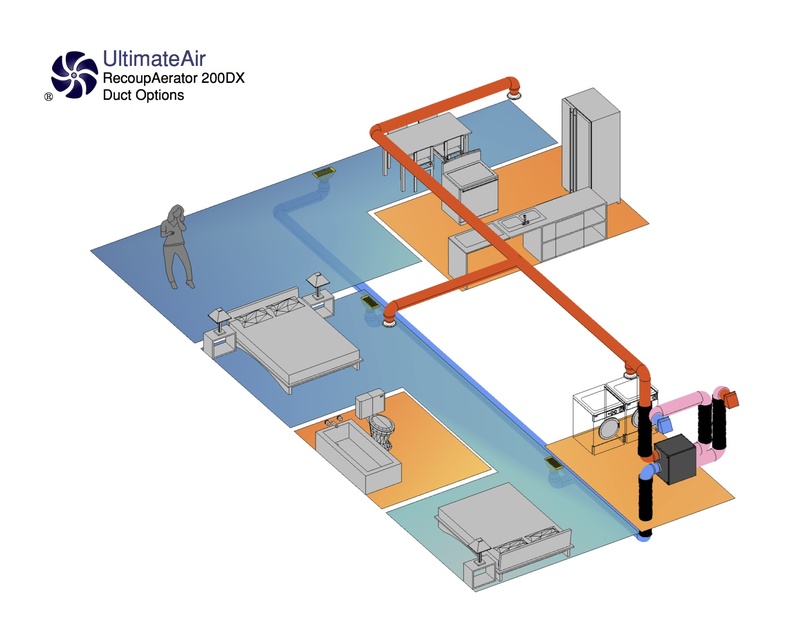 Ultimate Air is a variable speed unit from about 60 cfm to 200 cfm that will serve up to a 3000 square ft home. But the actual calculations are based on ASHRAE requirements for home ventilation based on either square or cubic foot of space inside the home. This entry was posted in Appliances, Energy Efficiency, Ventilation. Bookmark the permalink.